Take your favorite music anywhere! The Sound Buddha bag series is designed with freedom in mind. This bag features our specially designed pocket - ready to accommodate our D-Box portable speaker or whatever you need it for. Our D-Box speaker provides Crystal clear sound with convenient Bluetooth connectivity, which allows you the freedom jam out in style. The Sound Buddha bag features a light-weight fully versatile padded back-pack straps to add comfort. Those who love to walk the green will appreciate the additional padding. The quick action adjustable stand allows you to set it down quickly, resting your clubs securely on the green whichever angle you choose. Load it up with your favorite accessories to help make your golf game that much more exciting. 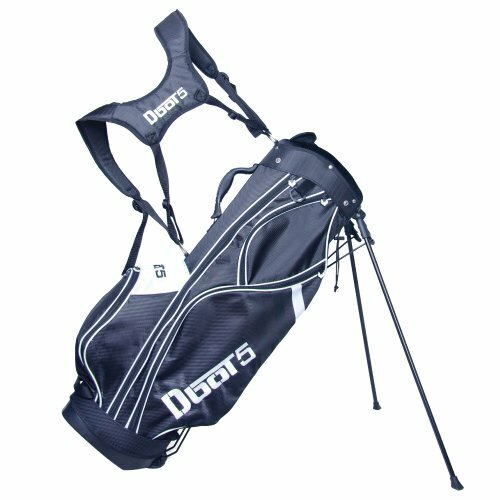 Dbot5's golf bag lets you express your EXTREME side without sacrificing performance or practicality. It offers cutting edge style and function, guaranteeing attention wherever you are. Our bags are a lightweight, 8 pocket design, including quick-access ball and tee pockets, and a larger, easily expandable pouch. The grab handle is a stout molded compound riveted to the frame with flexible bushings. The carrying harness has a two strap design for comfort and stability, which keeps the bag from twisting while you're walking. Made of durable weatherproof non-slip material, including a rain hood, this bag can handle whatever you throw at it and still maintain its extremely conspicuous style. If you have any questions about this product by Dbot5, contact us by completing and submitting the form below. If you are looking for a specif part number, please include it with your message.